1793 Cent. Sheldon-3. Chain, AMERICA. No Periods. MS-65 RB (PCGS). 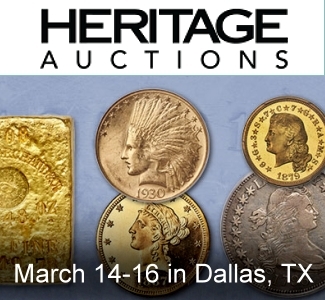 On February 9, Stack’s-Bowers, in association with Sotheby’s, will conduct the third auction of the Pogue Family Collection, which may be remembered as the all-time greatest assemblage of pre-1840 U.S. coins. A highlight of the collection is the 1793 Chain cent that was previously in the Garrett Family Collection. Chain cents are the first U.S. coins and this is almost certainly one of the four finest survivors, and is likely to be the only gem Chain cent with much original mint red color. The Garrett-Pogue 1793 Chain cent is of the major variety with ‘AMERICA’ entirely spelled and of the S-3 die pairing. I viewed this coin during the early 1990s and again about a year ago when it was exhibited at Sotheby’s headquarters in Manhattan. 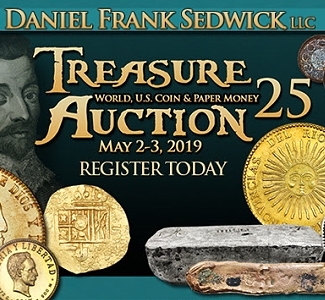 Coins in the Pogue III sale, and some scheduled to be in the Pogue IV sale in May, will be available for viewing in a public exhibit at Sotheby’s headquarters in Manhattan, which is scheduled to begin on Feb. 6. Until the mid-1850s, U.S. one-cent coins were around the size of quarters, much larger than current pennies. As I explained in my two-part series on 1792 half dismes, U.S. coins were not struck until 1793. Just copper coins, half cents and large cents, were produced at the Philadelphia Mint in 1793. Chain cents “were first struck in late February 1793,” finds R. W. Julian, the leading researcher. During 1793, three different design designs types of large cents were produced, Chain cents, Wreath Cents and Liberty Cap Cents. There are three major varieties of Chain cents. Although there are multiple differences, there are single features that immediately distinguish them. On the first (S-1),the word ‘America’ is abbreviated as “AMERI.” On all Chain Cents of the second and third major varieties, the word “AMERICA” is spelled out. The S-2, NC-1 and S-3 die pairings are of the ‘AMERICA, ‘no periods’ major variety. Dies are steel rods that are used in a coining press to impart designs on prepared blank pieces of metal (planchets) that thus become coins. The differences between the S-2 and the S-3 die parings are minor. The main difference is the width of the spacing of the numerals in the year ‘1793.’ Also, on S-3 cents, the ‘R’ in LIBERTY is unusually large and tilts a little. On the third subtype (S-4), there is a period after the word “LIBERTY” and a period after the numerals of the year “1793.” These are thus termed ‘With Periods’ Chain cents. The features of Miss Liberty are notably different as well. Collectors of large cents that grade higher than 62 usually seek just one Chain cent, regardless of variety. People assembling pertinent type sets likewise settle on just one Chain cent. Regarding totals for all die pairings, Chain cents are scarce overall and very few 63 to 67 grade coins are available to collectors. As was estimated in my discussion of Denis Loring’s 1793 Cents in 2011, about 1,500 Chain Cents survive. Some that are non-gradable have traded for less than US$1,250 each. Those may have extremely serious problems. A Fine-12 or so grade Chain cent could be found for around $20,000. 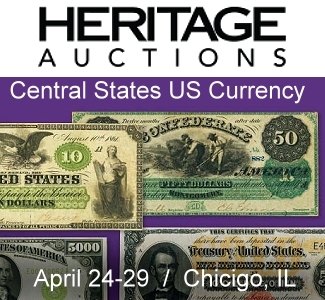 Most of the U.S. coins, patterns, and American colonials in the Garrett Family collection were auctioned by Bowers & Ruddy in 1979 and 1980. Some background about that collection and the Garrett family may be found in my discussion of the Garrett-Kaselitz 1838-O dime. Ted Naftzger assembled the all-time best collection of large cents. 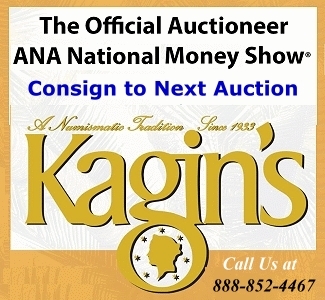 Early in 1992, Eric Streiner purchased most of Naftzger’s ‘early date’ (pre-1815) large cents. Stack’s (NY) then received a commission. Naftzger’s cents were not certified when Streiner acquired them. This Garrett S-3 was PCGS certified as ‘MS-65-RB’ when it was first submitted. In February 1992, Streiner sold most of the highest quality Naftzger ‘early dates’ to Jay Parrino. Later in 1992, Parrino showed the Garrett S-3 Chain cent to me. During the 1990s, it was acquired by the “Foxfire” collector, Dr. Claude Davis, who was represented by Richard Burdick. In 2003, Burdick negotiated the sale of the Foxfire Collection to the Pogue family. Dr. Davis had turned down offers from leading coin dealers, partly because he wished for his type set to become part of a private collection. The deal was consummated in 2004. A lifelong collector, Dr. Davis finds coins to be irresistible. Not long after selling the Foxfire type set, Dr. Davis started a new type set of AU grade coins. Most or all of it was auctioned by Heritage in Boston at an ANA convention in 2010. In 2002 or 2003, Dr. Davis’s “Foxfire Collection,” a type set, was entirely submitted to NGC, and the “Foxfire” pedigree was printed on each corresponding NGC label (‘insert’). This Garrett-Naftzger Chain cent was then NGC-certified as ‘MS-66-RB.’ It has since found its way back into a PCGS holder, again with a ‘MS-65-RB’ certification. It was thus downgraded. Richard Burdick wrote a monograph on the “The Foxfire Collection,” which was finished in June 2003. The Garrett-Foxfire Chain cent is itemized as coin #7 and the then current NGC serial #957212-007 is noted. Mark Salzberg personally handled the Foxfire submission. Salzberg is the chairman and largest shareholder of the parent company of NGC. Of the 175 or so listed coins in the collection, including many gem quality pre-1840 coins, he mentions just a few in the foreword to Burdick’s monograph. Salzberg emphasizes that the Garrett Chain cent is one of the “super coins”! Regarding the Garrett-Naftzger-Foxfire-Pogue 1793 cent, the ‘RB’ designation for having significant original ‘mint red’ color is merited. 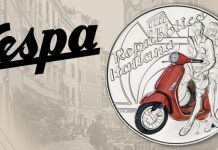 Although there are not bright red patches, substantial original red is blended with natural brown tones over much of this coin. When the Garrett-Pogue S-3 Chain cent is tilted under a lamp at particular angles, original red color really glistens. The mix of red and brown on the reverse (back) is such that the reverse is at least 30% red overall. This coin scores highly in the category of originality. Most collectors of early copper coins, however, do not value ‘originality’ as highly as I do. Many of them figure that a coin’s strike, the level of detail imparted when the coin was minted, is more important than originality. Weak impressions are major issues for them. Large cent specialists tend to be very concerned about mint-caused imperfections, which can be distracting. Before 1816, large cents and half cents were often sloppily made with very imperfect blanks (planchets). Dents, strange lines, foreign matter, rough areas, clips, and even corrosion, on planchets before striking were common realities in the production of early copper coins. In my opinion, mint-caused imperfections are minor concerns, and add to the character of the respective coins. A mint-caused imperfection is part of the legitimate history of the coin. It is worthwhile to learn about the realities of production processes and U.S. Mint policies in the past. Deliberate modifications of coins in later eras should be much more of a concern than mint-caused imperfections. Such deliberate modifications are often aimed at deceiving experts. Deliberate modifications would occur much more in quantity and magnitude if not criticized and exposed. Besides coin doctoring, large cents are often brushed to apply oils and other substances. Such brushing has been a very common practice among collectors and dealers for more than a century. Indeed, many 18th-century large cents are ‘full of oil,’ so to speak. It is not unusual for large cents to be soaked in jars of olive oil. One dealer assured me that he does this regularly. 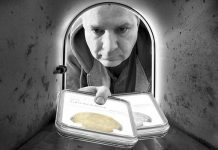 Personally, I am opposed to such practices, though I acknowledge they have been accepted as legitimate by many large cent dealers and some collectors. Almost all early large cents have been cleaned in one way or another. Some cleaning practices are much more harmful than others. Perhaps there is no 18th century coin that is even 99% original. For early U.S. coins, it is logical to factor originality as a matter of degree, and to not regard originality as an ‘all or nothing’ concept. A primary issue is the extent and consequences of cleanings. Moreover, many coins recover without assistance and naturally retone. I examined the Garrett-Naftzger-Pogue S-3 briefly on at least two occasions, in 1992 and in 2015. Each time, my interpretation was that it scores very highly in the category of originality, more so than other high grade Chain cents that I have inspected. I realize, of course, that other experts focus more on striking detail, planchet quality and technical factors. I am not expecting to persuade all copper enthusiasts to value originality as much as I do. My view, though, is consistent with the approaches of most sophisticated collectors of rare U.S. coins overall, not necessarily copper coins, over the last hundred years. Evidence has been provided to support this view. Hopefully, all copper experts agree that this Garrett Chain cent scores highly in the technical category. There are minimal contact marks. I do not remember any significant hairlines. Overall, it has minimal imperfections. The eye appeal is wonderful. When I first saw this coin, I was truly spellbound. 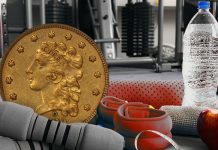 Reportedly, there is a gem Chain cent in a private collection in California that has never been submitted to PCGS or NGC. I am omitting that one from this discussion. Also, I am not now considering any that may be in museums. The Cleneay-Jackman-Ryder S-3 Chain cent is not on the list. Though it is famous, it has been overgraded and is not of gem quality. There is much agreement that the following six are exceptional Chain cents. I have inspected all of them. The Mickley-Sheldon-Naftzger piece has been PCGS certified as “SP-67BN” since 1992. Whether it is a business strike or a special striking, whether it grades 67 or 66+, it is the highest quality Chain cent of any variety. A collector in the South acquired it from Jay Parrino in 1996 or 1997. Recently, it received a sticker of approval from CAC. It is nearly flawless and has a very distinctive texture. It would be hard to explain. The Mickley-Sheldon-Naftzger ‘With Periods’ (S-4) really has to be seen in actuality to be interpreted and appreciated. The Mickley-Mackenzie-Parmelee cent was PCGS certified as ‘SP-65-BN’ back in 1992. It is glossy and dynamic. I believe I understood that it fulfills criteria to be a special striking when I examined it 1992, perhaps again in 1993, though my recollections of such inspections are imperfect. I hope I find my notes. This coin surfaced in 2011 after being in Nevada for more than 15 years. Bruce Morelan then bought it as part of a large group, as I reported in depth. The Mickley-Mackenzie-Parmelee was then CAC approved. John Albanese regards it as “an absolutely spectacular coin.” In March 2011, Albanese offered Morelan $2.5 million for this coin, and Morelan declined to sell it. The Stack’s-Bowers catalogue of the Cardinal Collection reveals that this coin is currently in the Simpson Collection or at least was in late 2012. Some may wonder as to why a PCGS-graded MS-65 coin is listed as being of higher quality than a PCGS graded MS-66 coin. Putting aside the fact that the “MS-66” coin (#4 below) was earlier PCGS-graded as MS-65, in the realm of very early copper, a certified MS-65-RB cent is generally (though not always) regarded as being of higher quality than a pertinent MS-66-BN cent. “I value the Pogue MS-65 ‘Red & Brown’ Chain cent higher than the MS-66 ‘Brown’ Chain cent that sold in the January 2015 FUN auction,” Albanese reveals. “I will not disclose my valuations of either coin at this time,” John adds. Albanese is the founder and president of CAC. Additionally, for copper coins from later in the 1790s, examples of certified “MS-65RB” coins being estimated to be worth more than corresponding “MS-66BN” coins could be found via the PCGS price guide. For later issues of large cents, for which coins with so called ‘full red’ mint color have been certified, relationships between prices and color designations are even more complicated. In any event, this is the only choice or gem uncirculated Chain cent that has a significant amount of original mint red color, as far as I know. It is more than very attractive and may very well grade in the high end of the 65 range. This coin was PCGS-certified as ‘MS-65-Brown’ in 1992 and then upgraded to ‘MS-66-Brown’ in the middle of 2014. 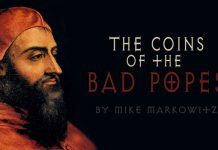 In 1992 or 1993, in my presence and in response to an inquiry from a collector-dealer from Nebraska, Parrino quoted an asking price of “$250,000” for this coin. It was not then sold. This Parmelee-Brand Chain cent was CAC-approved at the MS-66 level. It is an excellent coin, which scores well in the category of originality. As much as I like the coin, it is not nearly as exciting as the presently discussed Garrett-Pogue Chain cent. It just does not have as much pizazz. This coin was auctioned by Heritage in January 2015 during a FUN Platinum Night event. 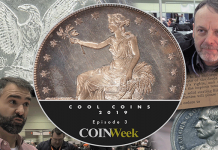 It then realized $2,350,000, an auction record for a U.S. copper coin, though less than the $2,585,000 price a copper pattern realized the same week, the Garrett-Partrick Birch piece. 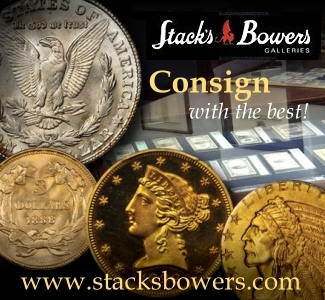 Stack’s-Bowers auctioned the Cardinal set of large cents on January 24, 2013, the same night that the Carter 1794 dollar brought more than $10 million! This Cardinal S-2 Chain cent was PCGS graded as “MS-65” before 2004. I first saw this coin in January 2005. ANR then auctioned it for $431,250, an amount that was then an auction record for a large cent. 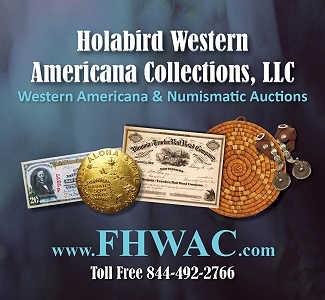 I covered that event for Numismatic News newspaper. I saw it again in January 2013 before Stack’s-Bowers sold it for $998,750, and I analyzed it in-depth before the auction. Although early copper specialists are very far from agreement with the assigned PCGS grade, I contend that it is accurate. This is a strictly uncirculated coin with minimal imperfections. Chain cents struck from the this pair of dies, the S-2 variety, tend to lack detail about the ear and nearby hair of Miss Liberty. The luster is complete, there are not many contact marks, and this coin is attractive. 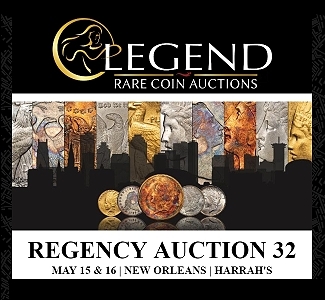 When Heritage auctioned the Eliasberg S-4 cent in January 2012, an auction record for a copper coin was set, $1.38 million, a strong price. I devoted a whole discussion to it. Has anyone thought more about gem Chain cents than I have? This Eliasberg-Atwater-Jung S-4 is struck wonderfully, with excellent detail, and has very few contact marks. Although Denis Loring finds it to be “fully mint state” and to grade above MS-60, most other early copper specialists, including Noyes and Bland, knock its net grade below 60 because of negative factors. Although I am not sure as to exactly why they do so, noticeable corrosion on the reverse, which seems to have been treated, is a concern. While almost all pre-1800 coppers have some degree of corrosion and traces of corrosion are normal, a pressing question is whether the dynamic aspects of this coin outweigh the corrosion such that the overall grade is in the 65 range. Certainly, the Cardinal S-2 scores higher than the Eliasberg S-4 in the technical category, though the Eliasberg S-4 cent is livelier. The Garrett-Pogue S-3 is clearly of higher quality than the Eliasberg S-4 Chain cent ‘with periods,’ which was auctioned for $1.38 million in January 2012. John Albanese, Richard Burdick and Denis Loring agree. “I saw the Pogue S-3 at the FUN Convention a few weeks ago, and I may well put it ahead of the [PCGS certified SP-67BN] Mickley S-4 as the best chain cent, due to its terrific color,” declares Denis Loring. He is one of the most experienced and most highly-respected of all large cent specialists. Denis “started specializing in large cents in 1965.” Loring completed a set of all ‘collectible’ varieties in the Sheldon system, plus more than 20 ‘non-collectible’ varieties, when he was just 27 years sold. 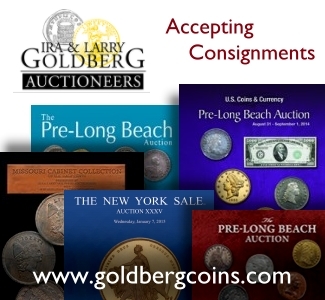 Loring has personally attended many auctions of major collections of large cents over the last 45 years. While Loring may place the Garrett-Pogue at the top, I rank two higher, partly because they are special strikings, which are inexplicably cool. The Garrett-Pogue Chain cent has the ‘mint bloom’ of a true business strike and is especially dynamic. 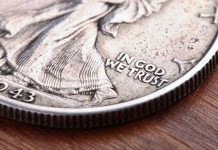 Chain cents are among the most popular and historically significant of all U.S. coins. The Garrett-Pogue Chain cent is one of the most important coins. 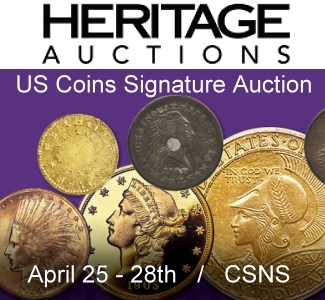 Previous articleSPINK USA Coin Auction to offer Portuguese, Brazilian and Anglo-Gallic Coins Plus Much More….